Do we know if there will be any new units? Discussion in 'General Discussions' started by Eagle Eye242, Aug 15, 2015. Nizam cedid failed, I know, and? Fact is that before disband in 1807 it was about 40% of total army. Before 1801 nizam cedid was about 25-30% of total army. It is still big ammount. For me few is 1-15% of total army. You can't understand that nizam cedid existed in XVIII in not small ammount, they were better in fight than janissarry and should be implemented in the game. These clearly shows that you know too little about Ottoman Empire. Do you know that Janissaries finally massacred Nizam-i-Cedid transformed into Sekban-i-Cedid units in 1808? Do you know that many Janissaries and many provincial or vassals units were not enlisted in Ottoman army, that's why wiki showed that Turkey had only 67,000 army, including 25,000 Nizam-i- Cedid units in 1807? Do you know that you can not count your percentages from that data? You could noticed that Turkey can raised many, old style provincial units in war time, however it was too hrad increase so quickly new model army. Then any percentages can not show you the real facts there. You should read more about Ottoman Empire in XVII-XIX centuries, then you will better undrestand why Selim's Nizam-i-Cedid reforms realized in 1790s soon after ended in failure. These few new model army regiments can not change basically outdated Ottoman army in late XVIII and early XIX century. History prove that Ottoman army lost many wars even agaisnt their past vassals Egypt and had lot of troubles even with their small subjects as like Serbs or Greeks insurgents at that times. What is more Nizam-i-Cedid units were raised too close to the end of C3 game timeline. In such case they can not saved Ottoman Empire in history and they can not in the game too. Source source source I don't want your speculation. You think that you are good historic but you are wrong. Go to the books or study in university, then you will be an expert and I will have to believe you for any empty word, but you are simple amateur now. Janissary won with nizam cedid because of their big influence in country and bigger size of army. Simple explanation and true. You sent above next false supositions. Janissaries were only part of Ottoman army and they alone can not crushed Selim's reforms. There were more conservative circles, muslim ulemas and many provincial govnors which did not want to see these new model army reforms. Therefore Janissaries could massacred Nizam-i-Cedid units and there was almost 0% of such units in 1808. However next Sultan Mahmud II better prepered next reforms. Then he managed massacring Janissaries in their barracks and forced disbandment of Janissaries Corps. Read about Auspicious incident 1826. If you need sources, go to closest library. I do not need to show you a way. Is it an argument against them? French "King's Musketeers" were organised in the only two companies (totally ~400 soldiers ). However it didn't prevent to add them into the game. 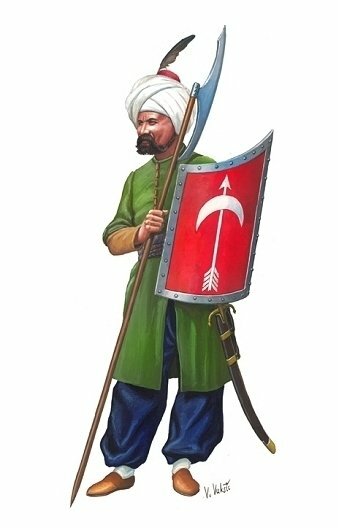 Developers eventuallly could add Nizam-i-Cedid infantrymen for Turkey in the end. Yes, they could. Of course - not as the main force of late Ottoman army (which should remain obsolete Janissaries etc. ), but as a small addition available only in late game. Foeurdr and [PR]Ernest like this. Unfortunately the Nizam-I Cedit Infantry might be a little past the time span of C1 and C3. They were not 18th C units but 19th C units. The Nizam-ı Cedit (from Arabic Nidhām al-Jadīd, meaning New Order) was a series of reforms not a military unit as such. But it makes sense to refer to Nizam-I Cedit Infantry. At a stretch, maybe the early Nizam-I Cedit reforms to 1807 might make the cut. Game-wise it is true that Turkey need a boost in the 18th C. I added an 18th C Janissary to Turkey in a rebalanced mod. But there was no historical justification for it as the Janissaries rather declined in the 18th C.
Polish towarzysze pancerni is great cavalry unit and a chainmail knight. I had to look it up on Wikiepedia. Does Poland need another boss cavalry unit? They could probably act as heavy horse in 17th C and a bit like Cuirassiers in 18thC. But why would you produce them when Poland can produce Polish Light Horse or Winged Hussars? This kind of considerations was never a problem for Cossacks devs, as a matter of fact: beside the fact you can field 16th c. Swiss or Austrian infantry along with 18th c. units, some of these latter are actually skinned after 19th c. uniforms. I'm thinking about Bavarian 18th c. musketeer, which roughly fits the Napoleonic era. On the other hand, Danish 18th c. musketeers are based on the 1701 Grenaderkorpset (converged grenadier regiment) uniforms. Yet they are supposed to fulfil more or less the same role in terms of gameplay, excpet that the Danes can actually throw non-upgradable grenades. The Prussian musketeers are designed upon Seven Years War Friedrich der Große's uniforms. So what they are doing in their choice of units really, is selecting what uniform represents a Nation the best, no real consideration for a cohesive time period. So at the end of the day, if we see 1806 dressed Bavarians, 1701 Danes, 1756 Prussians, I can't see any obstacle to grant Ottomans a 18th c. upgrade and Nizam-I-Cedit units, which are supposed to start being organized in the 1790's. Ottomans should have them, period. Foeurdr, Mike Erickson, Ftoomsh and 1 other person like this. I gave Turkey 18th C muskets in an experimental mod. I didn't call them Nizam-i-Cedit but I could have if I had known the term. For reasons of making it easy, I gave them an 18th C musket that needed no 18th C shot upgrades. It was already fully upgraded straight from the barracks and just needed the academy shot upgrades. This gave Turkey the option of skipping the last few Janissary shot upgrades and rushing to the 18th C. This also gave Turkey a timing attack window in early 18th C. Its 18th C musket however did not attain a full power equal to genuine 18th C nations' muskets at full power. It maybe had more numbers if you had a lot of barracks. But the idea was that in the late 18th C Turkey would still run out of power a bit compared to genuine 18th C nations. I improved Bedouin fire power and numbers too but again they still weren't quite a match for 18thC dragoons. Part of the dynamic balance of nations in the game should be that each nation has certain windows (points in time in its development) when its best attacking chances are at their best. The dynamic interplay of defending through your nation's weak phases and attacking in its strong phases is interesting and challenging. At the same time, the real battle field position still counts as well. You really do not get my point. I am not agaisnt Nizam-i-Cedid units. I am agianst XVIII century upgrade for Ottomans which in fact did not modernize their army at game timeline. They made few reforms too late in 1790s and these soon ended in failure. That's why I can accept Nizam-i-Cedid units only as characteristic unit for very late stage of the game. However bulk of Turkish army should be outdated in XVIII century and that was a FACT. Take in mind that French musketeers were created much earleir than Nizam-i-Cedid units. They both were characteristic units for France and Turkey and both did not change the main look of their armies. The first company of Musketeer, founded by Louis XIII in 1622, is made of 250 men, [...] Their weapons are the sword, the rifle (musket) and two pistols. The second company of Musketeer, founded by Louis XIV, after the death of the Cardinal Mazarin in 1661, is made of 250 men, [...] Their weapons are the same (as the first company). Those two company do their duty on foot and on horseback. I was to lazy to translate everything that talked about their uniforms, but if it interest someone I would do it. The first company goes by the nickname of grey musketeer and the second company is also know as the black musketeer because of the color of the horse of both company. Does they King's musketeers with the cross on their torse and back uniform, like Alexander Duma wrote about? Yes, it should be the first company under Louis XIII in the work of Dumas. At the time there were also the musketeer of the Cardinal, made for Richelieu to protect him, they will later become the second company under Louis XIV if I'm not mistaken. I don't know if they had the same uniform since what I found were the one reformed by Louis XIV. No because the even the first company was actually disbanded soon after the of Louis XIII (1643), in 1646, and King's Musketeers were not heard about anymore until 1657, when Louis XIV formed a first company of "Guard Musketeers" (not "King's Musketeers), when he was organizing (bascially creating) his Guard units (Maison du Roi) including the: Gardes Françaises, the Gardes Suisses (both two very large and powerful units), the Cent-Suisses, the Cent-Gentilshommes (both small companies tasked with mostly honorific duties) the Grenadiers à Cheval (actually both on foot and on horse, the true elite of the elite, even before the Musketeers), the Gardes du Corps, the Gendarmes de la Garde, the Chevaux-légers de la Garde (all of these were Horse Guards regiments), and the Mousquetaires de la Garde (technically "Guard Musketeers", not "King's Musketeers" anymore). A second company was formed in 1665. Technically they can be classified as Dragoon Guards, fighting on horseback and on foot likewise. The picture Foeurdr showed is actually the uniform of the Guard Musketeers of the King's House of 1685 ("Mousquetaires de la Garde de la Maison du Roi"). Louis XIV reinstated the same horse color pattern than the two companies of his predecessor: the first company, called the "Grey Musketeers", was given grey horses, then the second company was given black horses and thus called "Black Musketeers". So actually the "King's musketeers" existed only under Louis XIII ? I agree their uniform look pretty nice. So how long exist the regiment of a King's Musketeers? Yes, technically, the unit named "King's Musketeers" is a Louis XIII thing. The two companies of the Maison du Roi of Louis XIV were obviously inspired by them in style (same horse color patterns), but Louis XIV tweaked the uniforms (the first picture's sleeveless casaque is a 1685 prescription because the large overcoat covering the arms became so long and unpractical that fahsion has to bend the knee before practical issues) and the name of the unit. The recruitment standards, methods and officers' commissions conditions were also changed by Louis XIV (well under Le Tellier's wise patronage) in a way to avoid corrpution and merchandizing. So not quite the same unit really. I doubt the second picture uniform's depiction is really accurate for the Seven Years War period. The first picture is accurate (sleeveless casaque) for post 1685 (not talking about the vest and headgear) uniforms. But the uniforms of the two companies were identical as far as I know, so I would go for a parade uniform or just a fancy artistic representation. That's not a campaigning tenue. Well that's not a so simple question. The first two companies existed already under Louis XIII inside the Chevau-légers regiment (1620-1630's), but has nothing, at this point, to do with the King himself. Then Louis XIII created a special commission for the two companies and appointed the officer himself, thus making him, the King, officially Captain of the companies, hence the "King's Musketeers" name. You understand the name better if you take into consideration that at this time, and still at the start of the reign of Louis XIV, the French King has very little effective power on the army and the regiments, even the elite ones. The real military power was held by the Colonel-Général. Louis XIV ended this, but under Louis XIII, the King has only a direct grasp on these small units, hence the name. The unit was officially dismissed in 1646 by Mazarin probably because of political reasons. I would be very interested to see Polish Panzeri as a medium cavalry unit in the 17c and Ulans/Lancers in the 18c. I would also like the presence of Jagger`s - similar to the Chasseurs and Highlanders. Frederick the Great had such units, as did Hesse. Turkey was strong enough in the 17c and weak enough in the 18c as it has been, no need for changes there, I believe, besides the Tatas to have sabres. A new "unit" I would like to see is the log cabin for multiplayer games. However, it needs some changes to make it more realistic. It should need to be garrisoned with musket troops before it fires. Its firepower should depend on the number of musket troops inside and the loopholes. The troops inside must have their same realistic musket power as when out in the field. Except, permit much shorter minimum range due to safety in the cabin. Have realistic blind spots based on real geometry of the log cabin and its loopholes. A log cabin should have 12 loopholes. Four along each side and two at each end. It should have a maximum of 12 musket men allowed inside. If a log cabin is fighting on one side only or one side and one end only, permit the fire rate to be doubled as the other men are considered to be reloading. Log cabins should be burnable by fire arrows. Fire arrows should just out-range 17th C muskets but not 18th C muskets. With all these above conditions a great defensive line is to have cannon towers and log cabins alternating with each other in a line. They act to defend each other. Of course, cannon towers and log cabins are very vulnerable to field artillery so this defensive line is far from invulnerable. - Rename "Riders" to "17th Century Cuirassiers" and add them a pair of pistols (possible also another, local alternatives of such cavalry, for example the "Lobsters" for England or French "Gendarmes" with different stats). - In the role of ranged cavalry should be rather "Harquebusiers". "XVIIth Century Dragons" was infantry which only moving on horseback. I believe, besides the Tatas to have sabres. Tatars very rarely had sabres (only richer), usually instead it they had a one-handed flails made from horse/cow/sheep jaws. For example here (left).